You are here: Home | A Good Night’s Sleep. Is It Just A Dream? 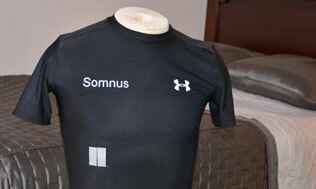 Nyx Devices has a Somnus sleep shirt made of extremely lightweight, breathable material embedded with thin, flexible sensors. Add in the SleepLogger and you can record the quality and the quantity of your sleep. ActiSleep SleepMonitorprovides sleep quality measurements such as sleep onset, sleep latency, total sleep time, number and duration of awakenings and sleep efficiency. Can be worn around ankle, wrist or waits. The FitBit Ultra tracks activity as well as sleep. Put the wireless device into the sleep wristband and it tracks your body’s movements, how often you wake up and actual sleep time. Zeo is a comprehensive system to help you improve your sleep. They offer a mobile and a bedside option. The bedside system is composed of a lightweight wireless headband, a bedside display, a set of online analytical tools, and an email-based personalized coaching program. They also have a quick online questionnaire to find out your sleep age. iPhone users can use their phone as a sleep monitor. The newer phones have an integrated sensor that lets apps like “Sleep Cycle” monitor sleep by simply placing it on your bed. And for .99 (U.S.) it certainly is an inexpensive way to learn how you sleep. Maybe a Polar Bear is all you need for a good night’s sleep? This pillowbot is designed to stop chronic snorers or those who suffer from sleep apnea by a gentle brush on the cheek. Or could your mattress be keeping you from the sleep you need? Check out The Better Sleep Council website for information about selecting and buying a mattress.